CBC Investigation: Who killed Lebanon’s Rafik Hariri? It wasn’t until late 2007 that the awkwardly titled UN International Independent Investigation Commission actually got around to some serious investigating. By then, nearly three years had passed since the spectacular public murder of Lebanon’s former prime minister Rafik Hariri. Hariri, the builder. The billionaire tycoon who’d reclaimed Beirut’s architectural heritage from the shattered cityscape of a civil war and made it his mission to restore Lebanon’s mercantile leadership. Hariri, the nationalist who’d had the courage to stand against Syria, Lebanon’s longtime occupier; and in his day was the most important reformer in the Middle East. The massive detonation that killed him on Feb. 14, 2005 unleashed forces no one knew were there. 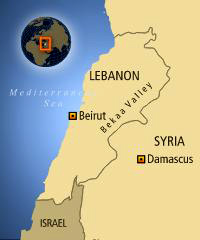 All of Lebanon seemed to rise up in the murder’s aftermath, furiously pointing at the country’s Syrian overlords. Lebanon’s fury quickly accomplished what the assassinated leader had failed to achieve in his lifetime. At the UN, France and the U.S. pushed the Security Council into dispatching a special investigative commission. For a time, it actually seemed that Lebanon was moving toward the rule of law and true democracy. Watch Neil Macdonald’s full documentary on The National Monday night at 9 p.m. ET in the live-stream version or at 10 p.m. ET on the main network. But, by the end of 2007, all that had ebbed. The killers remained uncaught. Syria was gradually reasserting its influence. And assassinations of other prominent Lebanese continued. In the White House, senior administration officials began to conclude that the UN’s famous clay feet were plodding toward nothing. In its first months, the UN inquiry had actually appeared promising. The first commissioner, a German judge named Detlev Mehlis, quickly delivered a blistering report suggesting Syria had ordered, if not actually carried out, the hit. Unspecified agents, Mehlis contended, had done the deed. Under his leadership, the commission spent most of its time chasing what turned out to be false leads and disproving wild conspiracy theories. That isn’t to say the commission didn’t have some good investigators. It did. In fact, it had a handful of the best that Western police agencies had to offer. But Brammertz could not be persuaded to authorize the one technique that those investigators wanted above all to deploy: telecommunications analysis, probably the single most important intelligence-gathering tool in modern times. Telecommunications analysts use powerful computers and highly sophisticated software to sift through millions of phone calls, seeking patterns, referencing and cross-referencing, identifying networks and associations. Police forces call it “telecomms.” Spy agencies call it “sigint.” It leads to convictions in courts and missile strikes in places like Afghanistan and Yemen. Unbelievably, though, the UN commission in Lebanon did no telecom analysis at all for most of its first three years of existence. It wasn’t until Brammertz was nearing the end of his term that one particularly dogged detective prodded him into letting the inquiry start examining phone records. At that point, in October of 2007, things began moving fast. Commission staff actually managed to obtain the records of every single phone call made in Lebanon the year of Hariri’s murder – a stunning amount of data – and brought in a British firm called FTS to carry out the specialized analysis. UN clerks worked day and night inputting data into a program called IBase. Then, in December, a specialist from FTS began examining what the computer was spitting out. Within two days, he called the UN investigators together. He had identified a small network of mobile phones, eight in all, that had been shadowing Hariri in the weeks prior to his death. It was the single biggest breakthrough the commission had accomplished since its formation – “earth-shattering,” in the words of one of the people in the room the day the network was identified. What the British analyst showed them was nothing less than the hit squad that had carried out the murder, or at least the phones they’d been carrying at the time. For the first time, commission investigators were staring at their quarry. The trouble was, the traces were now nearly three years old, long past the “golden hour” for harvesting the best clues. Still, it was something. And when the investigators began their due diligence, double-checking their work, there was another revelation, this one even more earth-shattering. Someone digging though the commission’s records turned up a report from a mid-ranking Lebanese policeman that had been sent over to the UN offices nearly a year and a half earlier, in the first months of 2006. Not only had the policeman identified what the UN would eventually dub the “red network” – the hit team – he had discovered much more. He had found the networks behind the networks. In fact, he’d uncovered a complex, disciplined plot that had been at least a year in the planning, and he had already questioned suspects. What’s more, everything he’d discovered pointed to one culprit: Hezbollah, the Party of God. All of this was in the policeman’s report, which he had dutifully sent to the UN officials with whom he was supposed to be partnering. And the UN commission had promptly lost it. Before his violent death in 2008, Wissam Eid was an unusual figure in the murky, often corrupt world of Arab policing. 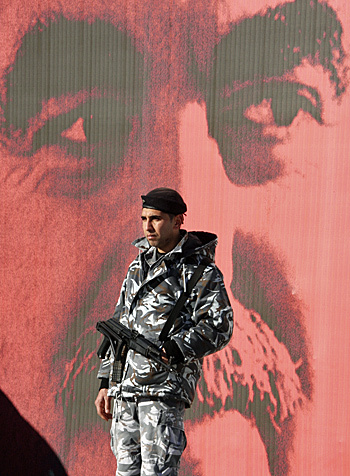 When he was doing his military service in the 1990s, the ISF, Lebanon’s all-encompassing security force, noticed Eid’s degree in computer engineering. The security service was then trying to build an information technology department. And that was that. “He was a patriot,” says his father Mahmoud, sitting in the living room of the family home in Deir Ammar, on the outskirts of Tripoli. The centerpiece of the room is, in the Arab way, a shrine to their son. The young man’s intense, chiselled countenance stares back at visitors over commendations and testimonials. 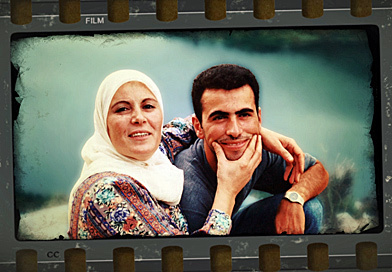 His mother Samira, a picture of Islamic dignity, is a religious person. It helps with the grief. The rest of her family is not particularly observant. But they all understand the savage realities of their country and how those realities clashed with Eid’s unyielding pursuit of some of the most dangerous people in the world. 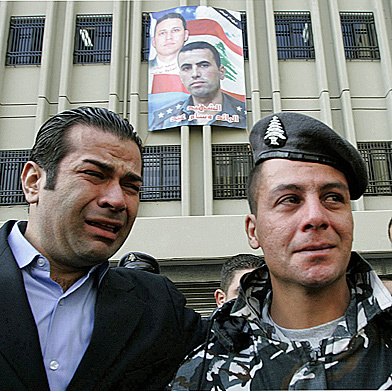 By the time Hariri was killed in 2005, Eid was a captain in the ISF. His boss, Lt.-Col. Samer Shehadeh, brought him into the investigation. It was a Lebanese investigation, Eid was told, but it was also a UN one. Eid was to co-operate with the foreigners working out of the old abandoned hotel in the hills above Beirut. Capt. Eid, though, wasn’t interested in delving into some of the wilder theories making the rounds in Lebanon. He reasoned that finding the first traces of the killers was a process of elimination. From Lebanon’s phone companies, he obtained the call records of all the cellphones that had registered with the cell towers in the immediate vicinity of the Hotel St. George, where the massive blast had torn a deep crater. Once Eid had those records, he began thinning out the hundreds of phones in the area that morning, subtracting those held by each of the 22 dead, then those in Hariri’s entourage, then those of people nearby who had been interviewed and had alibis. Soon enough, he had found the “red” phones the hit team had used. But he didn’t stop there. Exhaustively tracking which towers the red phones had “shaken hands with” in the days before the assassination, and comparing those records to Hariri’s schedule, he discovered that this network had been shadowing the former PM. But Eid had found another connection. He eventually identified eight other phones that had for months simultaneously used the same cell towers as the red phones. Signals intelligence professionals call these “co-location” phones. What Capt. Eid had discovered was that everyone on the hit team had carried a second phone, and that the team members had used their second phones to communicate with a much larger support network that had been in existence for at least a year. Eventually, the UN would label that group the “blue” network. The blue network also exercised considerable discipline. It, too, remained a “closed” network. Not once did any blue-network member make the sort of slip that telecom sleuths look for. But these people also carried co-location phones and Eid kept following the ever-widening trail of crumbs. The big break came when the blue network was closed down and the phones were collected by a minor electronics specialist who worked for Hezbollah, Abd al Majid al Ghamloush. Given the job of collecting and disposing of the blue phones, he noticed some still had time remaining on them and used one to call his girlfriend, Sawan, in the process basically identifying himself to Capt. Eid. He might as well have written his name on a whiteboard and held it up outside ISF headquarters. 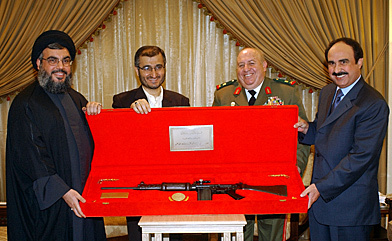 Ghamloush’s stupidity eventually led Eid to a pair of brothers named Hussein and Mouin Khreis, both Hezbollah operatives. One of them had actually been at the site of the blast. It has long been said that the fundamentalist fighters operate a command centre in the hospital. 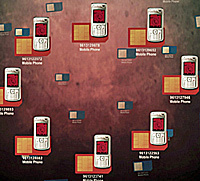 Eventually, telecom sleuths would identify another network of four so-called “pink phones” that had been communicating both with the hospital and, indirectly, with the other networks. These phones turned out to be tremendously important. It turned out they had been issued by the Lebanese government itself and when the ministry of communications was queried about who they had been issued to, the answer came back in the form of a bland government record. Hezbollah has several seats in the Lebanese legislature and at the time had been part of a governing coalition, hence the government-issued phones. Finally, Eid was handed a clue from the best source possible: He was contacted by Hezbollah itself and told that some of the phones he was chasing were being used by Hezbollah agents conducting a counter-espionage operation against Israel’s Mossad spy agency and that he needed to back off. The warning could not have been more clear. As though to underscore it, Eid’s boss, Lt.-Col. Shehadeh, was targeted by bombers in September 2006. The blast killed four of his bodyguards and nearly killed Shehadeh, who was sent to Quebec for medical treatment and resettlement. By that time, Capt. Eid had sent his report to the UN inquiry and moved on to another operation. The Eid report was entered into the UN’s database by someone who either didn’t understand it or didn’t care enough to bring it forward. It disappeared. A year and a half later, in December 2007, when the Eid report finally resurfaced, the immediate reaction of the UN telecom team was embarrassment. And then suspicion. Eid claimed to have performed his analysis using nothing but Excel spreadsheets and that, said the British specialist, was impossible. No one, he declared, could accomplish such a thing without powerful computer assistance and the requisite training. No amateur, which is how the specialists regarded Eid, could possibly have waded through the millions of possible permutations posed by the phone records and extracted individual networks. 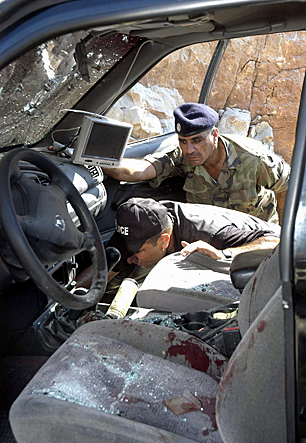 The car-bombing of Rafik Hariri in 2005 was by no means an isolated incident in Lebanon’s troubled history. Since 1977, at least a dozen prominent political leaders have been assassinated, including president Bashir Gemayel in 1982 and prime minister Rashid Karami in 1987. Gemayel’s nephew, Pierre Gemayel, a leader in the Christian Phalangist party and the minister of industry at the time, was shot and killed while driving in his car in November 2006, a year and half after Hariri and when Hezbollah was in the midst of quitting the pro-unity government in a protest against the UN special tribunal. The most recent outbreak of large-scale sectarian violence was in January and February 2008 when armed militias, made up of those like the pro-government Sunni gunman pictured above, fought in the streets of Tripoli and other large centres. This Capt. Eid must have had help, thought the telecom experts. Someone must have given him this information. Perhaps he was involved somehow? By now it was January 2008. A new UN commissioner was in charge, a Canadian justice official named Daniel Bellemare. Investigators were finally beginning to believe they were getting somewhere. A deputation of telecom experts was dispatched to meet Eid. They questioned him and returned convinced that, somehow, he had indeed identified the networks himself. Eid appeared to be one of those people who could intuit mathematical patterns, the sort who thinks several moves ahead in chess. Even better, he was willing to help directly. He wanted Hariri’s killers to face justice, Hezbollah’s warning be damned. It was an exciting prospect for the UN team. Here was an actual Lebanese investigator, with insights and contacts the UN foreigners could never match. A week later, a larger UN team met with Capt. Eid and, again, all went well. Then, the next day, Jan. 25, 2008, eight days after his first meeting with the UN investigators, Capt. Wissam Eid met precisely the same fate as Hariri. The bomb that ripped apart his four-wheel-drive vehicle also killed his bodyguard and three innocent bystanders. Lebanon gave Eid a televised funeral and, at the UN inquiry, there was outrage as well. But mixed with shame. Because there was no doubt in the mind of any member of the telecom team why Eid had died: Hezbollah, they deduced, had found out that Capt. Eid’s report had been discovered, that he’d met with the UN investigators and that he had agreed to work with them. Immediately, the telecom team had the records of the cell towers near the Eid blast site collected, reasoning the killers might once again have left digital footprints they could follow. Not this time, though. There was nothing. This time the killers did what they should have been doing all along: They’d used radios, not cellphones. Radios don’t leave a trace. That left the UN team with the obvious problem. Their adversary obviously knew not only what the UN investigators were doing, but knew in considerable detail. And the more the UN investigators thought about it, the more they focused on one man: Col. Wissam al Hassan, the new head of Lebanese intelligence. In the tradition of Middle Eastern intelligence chiefs, Col. Hassan is a puzzling, even feared figure in his own country. He was on the UN radar from the beginning, for two reasons: He quickly became one of the inquiry’s main liaisons with the ISF; plus he was in charge of Hariri’s security at the time of the assassination. 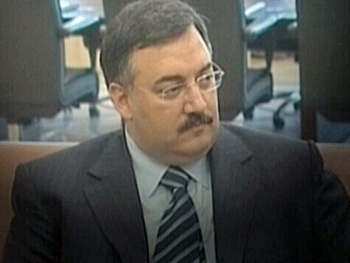 On July 9, 2005, Col. Hassan told UN investigators that he was enrolled in a computer course, Management Social et Humaine, at Lebanese University. He said that on the day before the assassination, Feb. 13, he had received a call from his professor, Yahya Rabih, informing him he was required to sit for an exam the next day. Twenty minutes later, he told investigators, Hariri had phoned, summoning him. Col. Hassan said he arrived at Hariri’s residence at 9:30 that evening and obtained his boss’s permission to attend the exam the next day. He spent the entire next morning studying for the exam, he told the UN, and turned off his phone when he entered the university, which was at just about the time Hariri died. “If I wasn’t sitting for that exam,” Hassan told investigators, “I would have been with Mr. Hariri” when he died. But Hassan’s phone records told another story entirely. In fact, it was Col. Hassan who called the professor, not the other way around. And Hassan placed the call half an hour after he had met Hariri earlier in the evening. The cell towers around Hassan’s home also showed that the next day Col. Hassan spent the hours before Hariri’s assassination, the time he was supposedly studying, on the phone. He made 24 calls, an average of one every nine minutes. 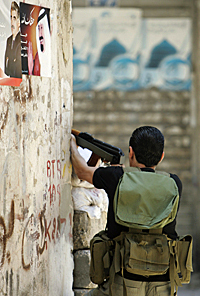 What was also disturbing the UN investigators was that high security officials in Lebanon don’t normally sit for exams. That report, obtained by CBC News, was prepared in late 2008 for Garry Loeppky, a former senior RCMP official who had taken over as the UN’s chief investigator that summer. That hadn’t been for lack of desire on the part of UN investigators. They’d wanted to check out Hassan’s alibi, to “get in his face,” in the words of one former detective, and pick apart his story. Lebanon’s vicious sectarian strife since the end of the Second World War cannot be fully understood without reference to the influx of Palestinian refugees who flooded into the country following the creation of Israel in 1948 and the Arab-Israeli War in 1967. Recently, the CBC’s Nahlah Ayed and colleagues from Radio-Canada spent some considerable time in Lebanon documenting the history and plight of these refugees and what they represent for the future of the region. Their stories can be read and viewed in our special report: Exile without end: Palestinians in Lebanon. At the very least, they wanted to contact Rabih, the professor. But Brammertz, the second UN commissioner, flatly ruled that out. He considered Hassan too valuable a contact and any such investigation as too disruptive. Nonetheless, the report states that Col. Hassan “is a key interlocutor for the commission. He is in a unique position to influence our investigation. As such, questions regarding his loyalty and intentions should be resolved. But even that wasn’t done. The UN commission’s management ignored the recommendation. Former UN investigators remain suspicious to this day of Hassan, who, they note, was eventually cut out of the inquiry’s loop. But Hassan did become Capt. Eid’s boss after the Hariri assassination. He certainly would have known about the sudden interest in the Eid report, and the meetings. “He rose, at the very least, to the level of a person of interest,” said another. Reached in Lebanon today, al Hassan repeatedly declined comment. In that time, he had 279 discussions with Hussein Khalil, the principal deputy of Hezbollah chieftain Hassan Nasrallah. Khalil in turn spoke 602 times to Wafik Safa, who is known in intelligence circles as the hard man who runs Hezbollah’s internal security department. No one asked Hassan about those calls, either. Hassan, though, also has his defenders. He remains a close ally of Hariri’s son Saad, the current Lebanese prime minister. Also, former U.S. officials, some of whom were in the Oval Office when then president George W. Bush vented his frustration with the commission’s apparent incompetence, maintain that Hassan is in fact a bitter enemy of Hezbollah, and casting suspicion on him merely plays into the group’s hands. That this particular UN memo about Hassan was ever written, says one former American security official, is evidence that the commission hadn’t the slightest idea what it was doing. Several former UN investigators, though, are unanimous. They believe Hezbollah infiltrated the commission and used Hassan in the process. 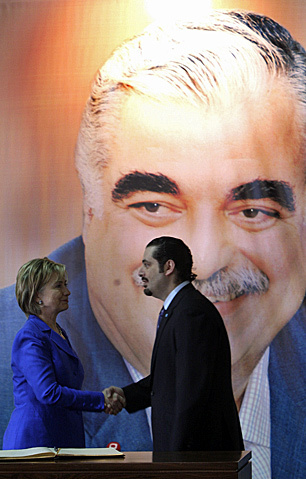 Nearly six years have now passed since Hariri’s assassination. The UN mandate was eventually expanded to include nine untargeted public bombings and 11 targeted attacks and assassinations, including that of Capt. Eid. 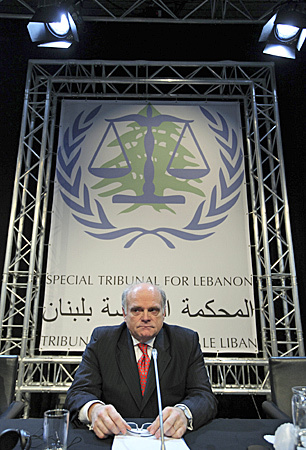 Daniel Bellemare oversaw the commission’s transformation into the Special Tribunal for Lebanon, residing in The Hague, and is now its chief prosecutor. The tribunal currently has an annual budget in excess of $40 million and more than 300 employees from 61 countries. It has a headquarters, a team of prosecutors, a defence office, judges, clerks, investigators and research staff, even access to detention facilities, but not a single accused. Bellemare is singularly uncommunicative about whatever progress has been made, as was Brammertz. From time to time, Bellemare has assured the Lebanese media that justice is proceeding, must remain confidential and shouldn’t be rushed. Bellemare refused repeated requests to speak to CBC News about this report. The commission’s telecom team eventually produced a succession of sophisticated charts depicting the phone networks behind the Hariri killing. CBC News has obtained a fairly recent iteration. In recent months, investigators even attached names to some of the red phones carried by the Hariri hit squad. But the biggest problem, according to several sources, has been converting the telecommunications analysis into evidence that will stand up in a court of law. Will the Canadian get his man? The CBC’s Nahlah Ayed interviewed Daniel Bellemare in March 2009. Her report can be read and viewedhere. That means someone has to find financial records, or witnesses or other evidence, to actually place the phones in the hands of the alleged perpetrators. As of mid-2009, sources say, the commission had not done so. What’s more, the commission never used wiretaps, even after it identified certain phones in networks that hadn’t gone dead. In all likelihood, any formal request to the Lebanese authorities for a phone tap would have become known in short order to Hezbollah, given its connections. And Bellemare wouldn’t allow his investigators to buy and use eavesdropping technology on their own. He had, though, gone cap-in-hand to Washington, looking for help from its intelligence agencies. There, he met with Bush’s national security adviser, Stephen Hadley, and with then secretary of state Condoleezza Rice. But he was rebuffed. Bellemare had not been Washington’s choice for the job and U.S. officials did not hold him in terribly high regard. They were aware he had been spending much of his time obsessing over the trappings of his UN offices, ordering in tailored clothes, boasting about his prosecutorial prowess and designing a personal coat of arms. His underlings had watched, bemused, as he dispatched security staff to Beirut’s more fashionable shopping districts to inquire about having the family crest embossed on pieces of jewelry. When Hadley politely inquired as to what Bellemare would consider a success – indictments, actual arrests, declarations of official suspicions? – the Canadian waffled, unable or unwilling to provide a precise answer. Meanwhile, back in Lebanon, Hezbollah had begun mounting a campaign to ensure that gathering supporting evidence would remain next to impossible. As rumours began surfacing in the Lebanese press that the UN tribunal was getting close to issuing indictments, Nasrallah, the Hezbollah chief, began warning that he will simply not tolerate arrests of any of his people. That’s no idle threat. Nasrallah operates a private militia considerably more powerful than the Lebanese army. And he also demanded that the UN tribunal, which is partially funded by Lebanon, be dissolved. In recent months, Nasrallah has taken to claiming that it was actually Israel that killed Hariri. More than one former UN investigator believes that should the telecommunications evidence ever be put before the Lebanese public, Nasrallah will acknowledge that his operatives were on the street when Hariri died, but claim that they were there chasing Israeli assassins. Nothing the UN has uncovered points remotely at Israel. Everything points at Hezbollah. But invoking Israel always gains traction in the Arab world. One formerly senior official with the commission says “considerable progress” was made during the most recent months of Bellemare’s term in gathering evidence to support the telecommunications work. But, he concedes, the evidence is still largely circumstantial. That may be all the excuse that Prime Minister Saad Hariri and his political allies need to let this commission die. Saad Hariri and his supporters originally blamed Syria for the assassination. But they’ve been backpedaling in recent months. Hariri recently exonerated Syria, repudiating his own sworn statement to UN investigators in 2005. He has also called for an investigation of Nasrallah’s claims that Israel killed his father. 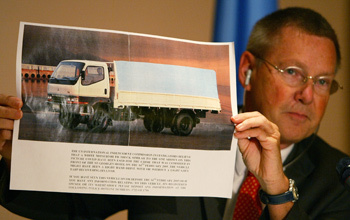 Detlev Mehlis, the first UN commissioner, told CBC News recently that it has always been obvious Syria ordered the Hariri hit. That it would use Hezbollah, its long-time proxy, he says, is only logical. The elder Hariri, Mehlis noted, had pushed not just for a Syrian withdrawal but also for the disarming of Hezbollah’s feared militia. Scott Carpenter, a former Bush administration official dispatched by the White House to Lebanon in the wake of Hariri’s death, also says the reality is obvious. Capt. Eid, who was posthumously promoted to the rank of major, lies in a grave not far from the family home in Deir Ammar. His picture is everywhere in the city, looking down upon streets, cafes and restaurants. He is uniformly described as a martyr to his country. Mohammed Eid says that by late 2007, his older brother had begun living in his office, convinced he probably didn’t have much longer to live. 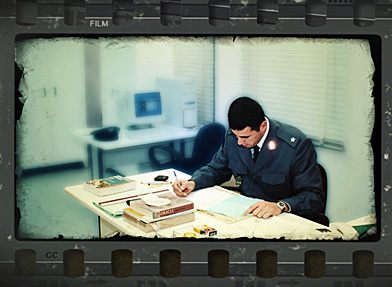 He asked Mohammed to make the video, which depicts him working at his desk in the ISF’s Beirut headquarters. In it, he banters with people off-screen; it is unremarkable footage, but haunting to anyone who knows his story. Eid’s mother, Samira, says her son was a gift to their country and believes that, as a martyr, he remains with her eternally. “If we have a few other Wissams in Lebanon, the country will be just fine,” she says. Her husband just stares sadly into space. She and her husband and their three surviving sons know almost certainly who killed Wissam. But this is Lebanon, and they understand the consequences of talking about that. Mohammed Eid says the family has even come to realize that Lebanon could pay a bloody price if his brother’s murderers are ever charged. “C’est pas le moment,” he says, in the family’s second language. But of his brother’s investigative skill, the family has no doubt. In 2009, before the UN inquiry packed up and left for The Hague, an Australian prosecutor named Raelene Sharp, who’d been working for the commission, paid the Eid family a surprise visit. Neil Macdonald is the senior Washington correspondent for CBC News. In the course of a career that began in 1976, Macdonald has covered six elections and six prime ministers. He joined CBC News in 1988 following 12 years in newspapers and was initially assigned to Parliament Hill where he reported on federal politics for The National. Before taking up his post in Washington, in March 2003, Macdonald reported from the Middle East for five years. He won Gemini Awards in 2004 and 2009 for best reportage; the most recent for his reporting on the economic crisis. He speaks English and French fluently, and some Arabic.